Today I am going to talk about Nora’s Nursery Cloth Diapers! This 15 piece set for less than $60 is really the best deal around, 7 pocket diapers, 7 eco-friendly bamboo inserts and 1 wet bag! Plus they come in multiple color options. My favorite is the gender neutral monochrome collection. The Nora’s Nursery diapers are considered a pocket diaper, so it consists of a removable insert that slips between two sewn together pieces of fabric that make up the cover. What is great, is that these diapers grow with your baby, the same diaper can fit a 10lbs baby and a 33lbs baby. Liam started wearing cloth diapers a week or so after we got home from the hospital. I honestly would have started using them sooner but after an unexpected c-section I was just not ready to do laundry! My husband even cloth diapers our son, (both of our mothers even cloth diaper, I always leave them with cloth and disposable and they choose cloth!) My husband appreciates that we don’t have to spend money every week buying disposable diapers. There are MANY benefits to cloth diapering, other than the initial investment, it truly is a money saver, because these diapers will last you through potty training. The average family using “Green Diapers” aka chlorine-free, perfume-free, dye-free, latex free, semi-biodegradable, spends $100-$120 a month on disposable diapers, depending on how old their baby is. That’s $3000-$4000 on diapers depending on how old your child is when they are potty trained. The third benefit, and some days the most important one, is almost ZERO blow outs! A blow out usually stems from user error! Either the diaper did not get put on with the proper snaps, or it is time to adjust the snaps to a larger setting. Now, cloth diapers are like sponges, they can only hold so much “stuff” before they are no longer absorbent. So leaking due to failure to change a diaper, does not count! Washing is very simple. We place the diapers straight into an XL wet bag (just like you would place a disposable diaper into a trash can.) I have enough cloth diapers now that I can do laundry every other day. I just counted, I believe I have 42 diapers. I have 5 that did not work well for newborn poop, so lets say I have 37 diapers. Anyway, all I do, is take the wet bag, stick the opening inside the washer drum, and shake the diapers out! The diapers with pockets and inserts or extra night time inserts, come out on their own, I don’t even have to touch the dirty diapers. (My husband will even dumb them into the washer if need be.) The first wash I do is a short, express wash cycle, with cold water and no detergent. Followed by a normal wash cycle, with hot water and detergent. Then I repeat the first cycle, express wash, cold water, no detergent, usually with an extra rinse cycle. Then I hang them to dry! One thing that I love about the Nora’s Nursery Diapers, is that they dry the fastest out of all the diaper brands that I have. In the climate I live in, when it is warm/sunny outside I have no problem hanging them to dry outside, however during the winter, when the diapers have to be hung inside. I typically will throw the diapers in the dryer on very low heat for 10 minutes if they are damp and that usually does the trick. DID YOU KNOW?! That you can “Bleach” diapers in the sun?! 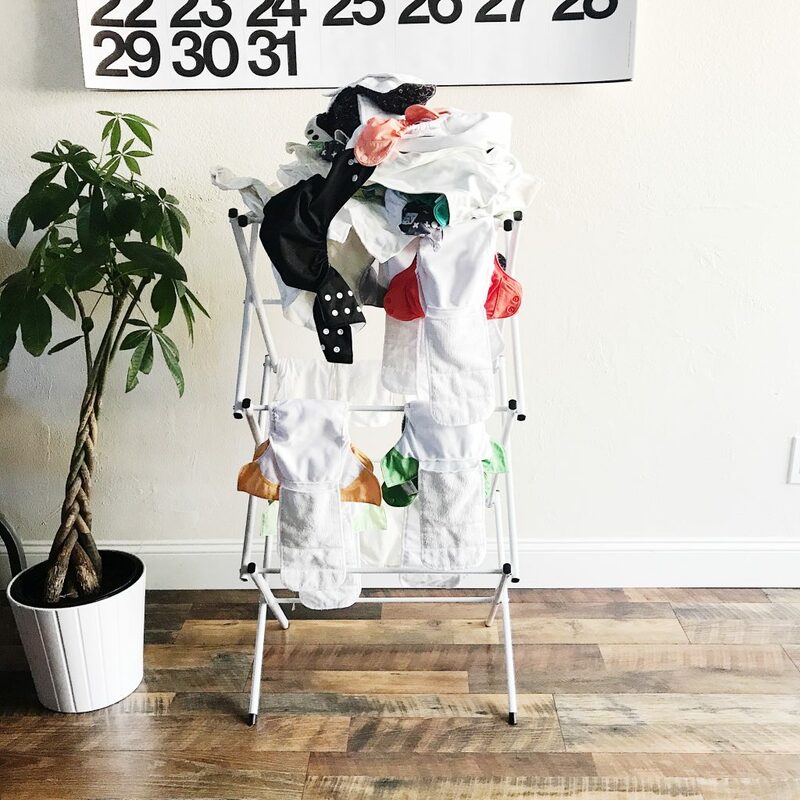 By hanging your cloth diapers outside in the sun, the sun will “Bleach” away any newborn poop stains, and will kill bacteria and manage odor. If you are in the market for a pocket cloth diaper, I would definitely recommend Nora’s Nursery Diapers!